Running, guinea pigs, costumes, and guinea pigs in costumes. The second outing of the Thanksgiving Dinner costume, this time on Thanksgiving day! This race was untimed, so no pressure there. The glass and corn came off the costume during the last race, so I glued another glass on the table and put carrots on where the corn used to be. The race took place downtown Ann Arbor. It started to snow right before the race, so things were a little slick. My drinking glass was half-way filled with snow! 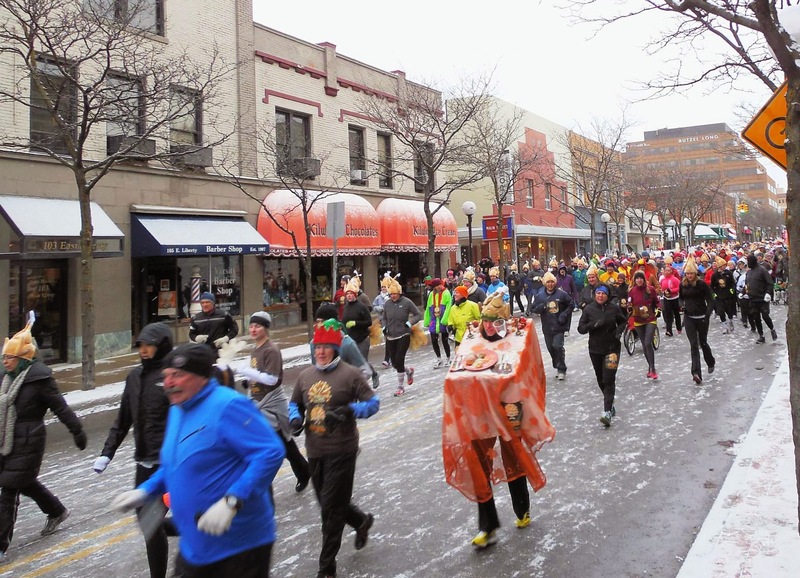 The race went down Main St. down to Michigan Stadium and looped back up around. A little hilly, but not bad. About a mile in I had a costume malfunction. Under the table I had a bag stuffed with coats and blankets, which helped support everything. During the run a coat fell out of the bag and onto the road. A super nice woman stopped and helped me get the coat back into the bag; so thankful that she stopped! After getting everything situated, I tootled on, past the hot chocolate aid station and onwards to the finishing line. After the race my tiny T-Rex arms were shaking from supporting the table for so long. It's an awfully good arm workout! Michigan Running Man captured a video of the 3,000 runners. I'm tootling around in there around the 1:20 mark.